The Cassini mission's last image of Saturn's moon Titan was taken just four days before the spacecraft plummeted into the gas giant in September 2017. Titan has successfully clung to its mysteries even in the wake of the Cassini mission. That's particularly impressive, since the Cassini spacecraft carried a European Space Agency probe called Huygens, which landed on the odd moon. One of those mysteries is on display in this image, which shows only a couple small clouds (the pale areas near the center of the image), despite having been snapped during a time when scientists had expected to see substantial cloudiness on the moon. 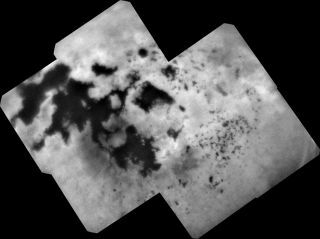 This annotated view of Cassini's last photo of Titan, Saturn's largest moon, points out the lakes of liquid methane and larger seas like Kraken Mare, Punga Mare and Ligeia Mare. But puzzle aside, the lack of clouds makes it easier to admire the lakes that dot Titan's surface, which appear here as dark areas. The large network of dark splotches to the left of this image is a lake known as Kraken Mare, with Punga Mare above and Ligeia Mare below the center of the image. When Cassini captured this image, it was about 87,000 miles (140,000 kilometers) above the moon's surface. Although Cassini's days around the moon are over, scientists hope to be able to someday revisit Titan with a dedicated mission — NASA is considering one such mission called Dragonfly, which would be able to hop around the moon's surface. Cassini's mission ended on Sept. 15, 2017, when the spacecraft plunged into Saturn in an intentional death dive. NASA won an Emmy award this month for the space agency's coverage of the end of Cassini's mission at Saturn.